While social networking may be one of the best way to instantly reach people from anywhere and keep them updated of your life, it can at the same time invite all kinds of problems that sometimes can’t ever be undone. 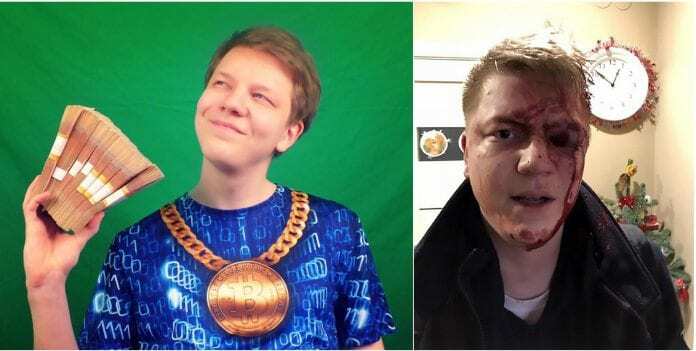 A Russian cryptocurrency investor and YouTube blogger who had taken to social media and posted videos to show off his wealth online has been found dead in an apparent suicide in his apartment. Pavel Myakushin, 23, also known as Pavel Nyashin, was the victim of a robbery in January, which saw 24 million Russian rubles (approximately $38,000 USD) stolen from his safe. At that time, the blogger had mentioned that he had boasted about his wealth on YouTube which accidentally revealed his address and made him an easy target for robbers. The assault was carried out by a gang dressed in Santa Claus costumes in the village of Lazurniye Berega, just outside St. Petersburg in northwest Russia. Besides stealing a large amount of money, the gang also fled away with a number of iPhone X handsets and crashed Myakushin’s Bitcoin mining farm, which he used to assemble his cryptocurrency fortune. According to Myakushin’s mother, a large amount of the stolen cash belonged to potential Bitcoin investors. The robbery had left Myakushin depressed since January, as he was unable to pay the money back. His mother was reported to have pointed that the robbery could have led him to take his own life. The police say that there was no sign of anyone else being involved in Pavel’s death. Also, there is no news if the gang who robbed him has ever been caught. Myakushin, who blogged about cryptocurrency as well as provided consultancy service for potential investors had a popular YouTube channel with almost 20,000 subscribers.